Last year I dislocated my hip for the third time and sadly had to cancel the workshop “Colours of the Romans” at Fishbourne Roman Palace. This was particularly frustrating, as I had had to postpone a previous workshop at Fishbourne a couple of years ago when I dislocated my hip the first time. Fortunately, this earlier workshop was re-scheduled but my physical health has become so unreliable that I have decided to “retire” from workshops, except for those on a one-to-one basis at my home. As I had already done all the preparations for “Colours of the Romans”, including printing off all the information sheets and sample cards and preparing the wool sample sets, I decided to offer the workshop to the education department at Fishbourne, rather than let all my work go to waste. Katrina Burton, Head of Learning at Fishbourne, and Beverly Lee, the Education Officer, took up my offer and earlier this year they came to my home for the workshop. Louise Spong, from South Downs Yarn, also joined us and assisted with the heavier physical work, which has become too much for me following my recent hip surgery. The dyes used by the Romans included madder, kermes, weld, woad, walnut hulls, oak galls, saffron and lichen purple. With the exception of kermes, which is no longer available, these were the dyes we used on the course. According to Pliny the Elder, orange, red and purple were colours worn by priests and priestesses. Purple was the colour for high officials and the purple clothing of Emperors was dyed purple using a dye from shellfish of the Murex species. The dye colour was known as Tyrian or Imperial Purple and vast quantities of shellfish were required to produce relatively small amounts of dye material. 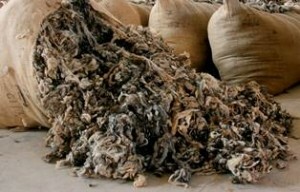 This mollusc dye was overused and the supply of shellfish gradually dwindled. By the Middle Ages, the Tyrian Purple dye industry had become considerably reduced and with the fall of Constantinople in 1453 it more or less disappeared. A purple dye from the lichen Roccella tinctoria was used by the Romans to simulate the purple from shellfish. Madder is a source of red dye and, according to Pliny, it was cultivated near Rome c.50AD. It is interesting to note that, although there is evidence that the Romans used madder when they were in Britain, its use in Britain appears to have ceased for a period after the Romans left (c.410AD). This would seem to suggest that the Romans imported madder from Rome as a prepared dried dyestuff, rather than cultivating it in Britain. This red insect dye comes from the shield louse Kermes vermilio, which lives on the kermes oak found in various parts of the Mediterranean. Today kermes is very difficult to obtain, although the insects may still occasionally be found on host trees around the Mediterranean. Weld is one of the most ancient dyes and has better colour-fastness than most other yellow dyes. The yellow from weld was the colour worn by the six Vestal Virgins and was also the colour of Roman wedding garments. Woad was used by the Romans as a source of indigo blue dye. Indigo from Indigofera tinctoria was also used by the Romans, but as a paint pigment rather than as a textile dye. It was probably brought to Rome from India in small quantities via the land route. Oak galls are rich in tannin and were used by the Romans in combination with iron to make a black dye. When used alone as a dye, oak galls give tan and light brown colours. According to Pliny, the outer green hulls of walnuts were used as a brown dye for wool and hair. According to Pliny, saffron was cultivated in Abruzzo and Sicily & was used as a yellow dye. Although saffron is very expensive, only a very small amount is required for dyeing and for the workshop samples we used only about half a gramme. Another dye reportedly used for yellow was turmeric, from the roots of Curcuma longa, which was imported from the Orient during Imperial times. The Romans used alum as a mordant and also iron but, as with madder, it is likely that alum was imported from Italy for Roman use and was not available in Britain after the departure of the Romans until it was imported in the later Anglo-Saxon period. 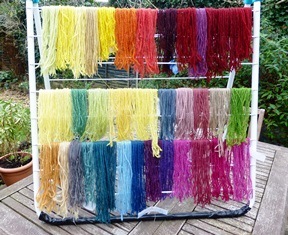 The photo below shows the colours we achieved on the samples we dyed at the workshop. More information on most of these dyes can be found in my latest book “A Heritage of Colour”. Life can be full of pleasant surprises! 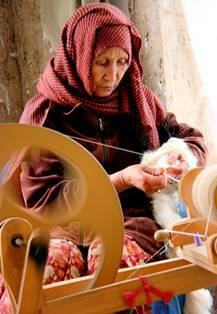 Following an exchange of emails with Jane Mundy, who has set up a project in Afghanistan, working with Afghan women using the fibre from cashmere goats to hand-spin yarn for knitting, this week I met Jane to find out more about her work. 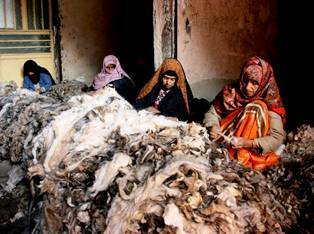 The project, called Qaria Cashmere, aims to give Afghan women the opportunity to learn skills which will enable them to gain some independence and make a living using materials from Afghanistan. 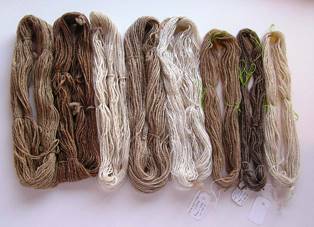 The Afghan cashmere fibre is wonderfully fine and soft and comes in lovely natural white, brown and grey shades. 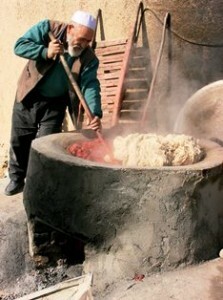 However, some of the yarn will be dyed using natural dyes and this is where I hope to be involved. 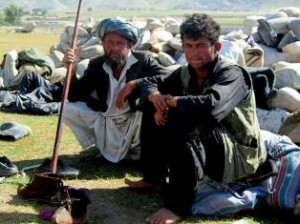 The natural dyes most commonly used in Afghanistan to dye wool for carpets are madder, indigo, walnut hulls and pomegranate rind and a wild form of larkspur is also used to dye yellows. So my next task will be to test dye some of the cashmere yarns, using dyes which should be available to the Afghan women from the local carpet weavers or from the market. Cashmere fibres will require special treatment to ensure they don’t felt during the dyeing process but I’m sure it will be possible to develop mordanting and dyeing techniques which will be suitable for this lovely fibre. Jane left me some cashmere fibre which I will hand-spin for these tests. However, I fear my skeins will not look as lovely and evenly-spun as those produced by expert hand-spinner, Amanda Hannaford, and shown below. I will write further posts giving more details of the Qaria Cashmere project. 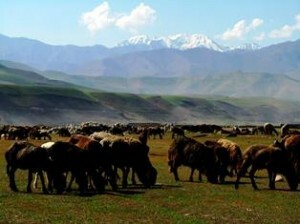 The project has a Facebook page “Qaria Cashmere” and a website (www.qariacashmere.com) is currently being developed.